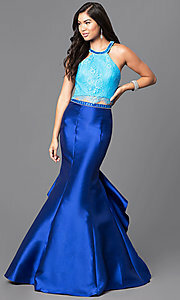 Unfortunately, the dress you are looking for (Style: CD-1641, Name: CD-1641) is no longer available. 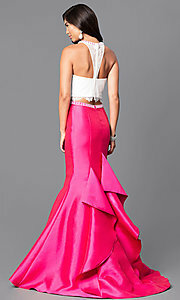 Two-piece, jeweled collar, mock-halter prom dress with lace t-back bodice and a floor-length trumpet skirt with ruffles on the back and an embellished waistband. Top 15" Bottom 48" Hollow to Hem 62"